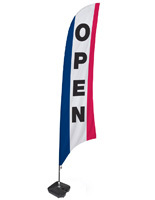 These message flags with "Open" printing are the perfect addition to any store or retail setting. 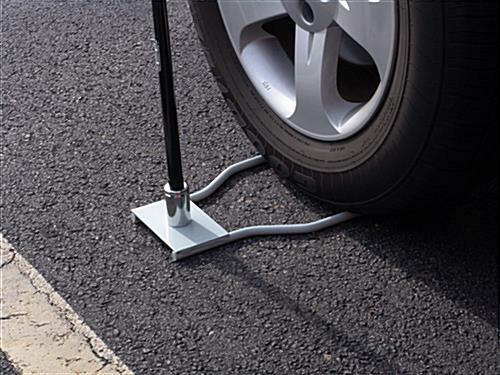 The banners are designed for outdoor use on the pavement with the use of a car-foot base. 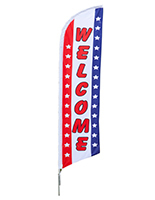 Each of the polyester flags is printed with red, white and blue colors for ultimate exposure to customers. 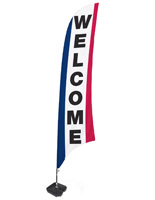 The 13' tall advertising accessory is made from polyester for durability outdoors. These flags are not for use in over 20 mph. winds. Order for your upcoming opening today! Please Note: These banners are NOT designed to be used in winds exceeding 20 mph. Doing so may cause damage to the unit.